Manufacturing for this product has been discontinued. As an alternative, please refer to the D60 with Firmware 7.7 or newer and User Interface Option E: 7” Graphical Front Panel Display. The D90Plus is a sub-cycle line distance protection system and bay controller suitable for protecting transmission lines and cables including lines equipped with series compensation. The D90Plus supports dual-breaker applications and can be used for single or three-pole tripping. The D90Plus supports different teleprotection schemes, including DCB, DCU, POTT, Hybrid POTT, and PUTT. 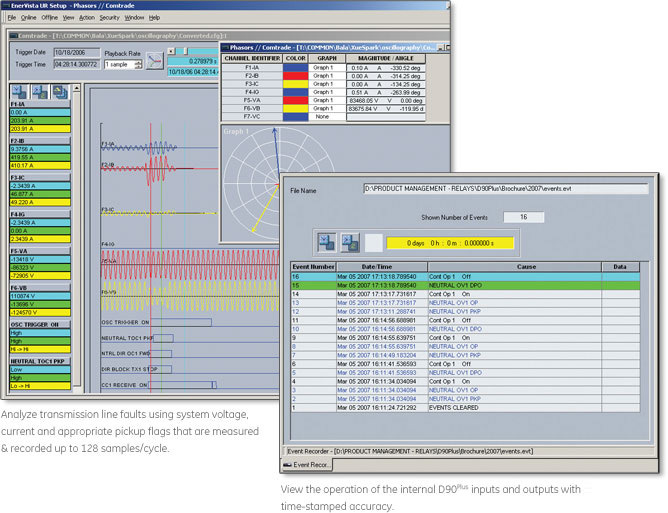 The D90Plus also provides synchrophasor measurement over Ethernet per IEEE C37.118. Modern power systems are under increasing constraints in their ability to transmit power from generation facilities to major load centers, and are forced to operate closer to their natural stability limits. Under these conditions, the critical clearing angle – and corresponding critical clearing time – become progressively smaller and there is an increasing need to minimize the fault clearing time on these constrained circuits. The D90Plus is ideally suited for application on circuits where fast fault detection and small breaker failure margin are required. The D90Plus allows transmission limits to be maintained or even increased while respecting the transient stability limits of the power system. The D90Plus includes detailed metering and recording for all AC signals. Voltage, current, and power metering are built into the relay as a standard feature. Current and voltage parameters are available as total RMS magnitude, and as fundamental frequency magnitude and angle. Control screen for the pre-configured bay with breaker & disconnect control in multiple pages using dedicated pushbuttons on the front panel. The D90Plus incorporates advanced automation features including powerful FlexLogic™ (user programmable logic) independent for protection and automation schemes. 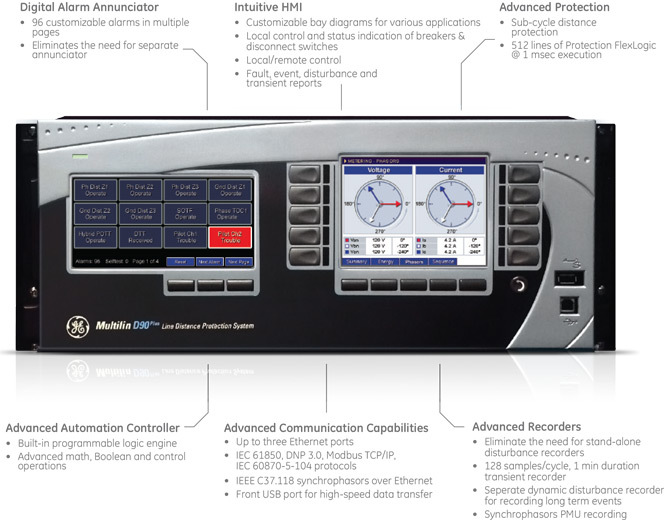 Combined with the communication capabilities, the D90Plus provides an advanced, highly flexible platform for substation automation applications. The D90Plus integrates seamlessly with other relays for distributed applications like interlocking and special protection schemes. D90Plus user programmable protection logic and independent automation logic allows users to build custom protection and automation schemes. The D90Plus provides for secure remote data and engineering access, making it easy and flexible to use and integrate into new and existing infrastructures. Fiber optic Ethernet provides high-bandwidth communications allowing for low-latency controls and high-speed file transfers of relay fault and event record information. The availability of three independently configurable Ethernet options provide the means to create fault tolerant communication architectures in an easy, cost-effective manner. The D90Plus supports the most popular industry standard protocols enabling easy, direct integration into SCADA systems. Multilin devices and relays are designed with simple but powerful security to enable reliability and compliance for virtually any project or implementation. With support for multi-level permissions and multi-factor supervisory controls, Multilin devices can help you manage the integrity of your system during commissioning, testing, implementation, and beyond. The UR and URPlus families provide separate authentication for settings and commands to the system. In addition, as discrete authentications for local and remote access, they also provide a supervisory control factor that can lock or unlock a device for configuration changes and other modifications. Multilin’s family of protection and control products can also help enable your security perimeter and intrusion detection programs. By providing essential alarming and logging of critical events, Multilin devices can help you detect potential breaches within your system and allow you to respond quickly and effectively. Specifically, unsuccessful access attempts are logged, alarmed, and lead to potential attackers being locked out. This ensures the reliability of your system during questionable activity, and a control factor that can lock or unlock a device for configuration changes and other modifications.